For the Latin archbishops, see Roman Catholic Archdiocese of Athens. This is a list of Bishops, Metropolitans, and Archbishops of Athens. The Church of Athens was created by Paul the Apostle during his second missionary journey, when he preached at the Areopagus, probably in 51 AD. 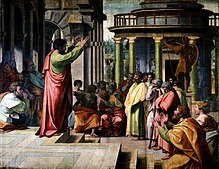 According to the Acts of the Apostles (17:16–34), after the sermon, a number of people became followers of Paul, thus forming the kernel of the Church in Athens. The see of Athens has been unilaterally declared autocephalous on 4 August 1833 (officially recognized by the Ecumenical Patriarchate of Constantinople on 11 July 1850), and was elevated to an archbishopric on 31 December 1923. As the head of the Church of Greece, the holder is styled Archbishop of Athens and All Greece (Αρχιεπίσκοπος Αθηνών και πάσης Ελλάδος). 9 Clematius c. 325 ? 18 John III c. 714 ? 30 Nicetas I 869/870 881? 52 Michael II Choniates 1182 1222? 69 Sophronius I 1565 1574? 75 Anthimus III 1606 1611? 76 Cyril I 1611 1619? 93 Gabriel II 1781? 1781? ^ "Ιστορία της Εκκλησίας των Αθηνών: Ίδρυση της Εκκλησίας των Αθηνών" (in Greek). Archbishopric of Athens. Archived from the original on 21 July 2015. Retrieved 26 September 2015. Wikimedia Commons has media related to Archbishops of Greece. (in Greek) Archdiocese of Athens Official website. (in Greek) Ιστορία της Εκκλησίας των Αθηνών: Διατελέσαντες Αρχιεπίσκοποι και Μητροπολίτες Αθηνών. Ιερά Αρχιεπισκοπή Αθηνών. This page was last edited on 30 December 2018, at 09:32 (UTC).